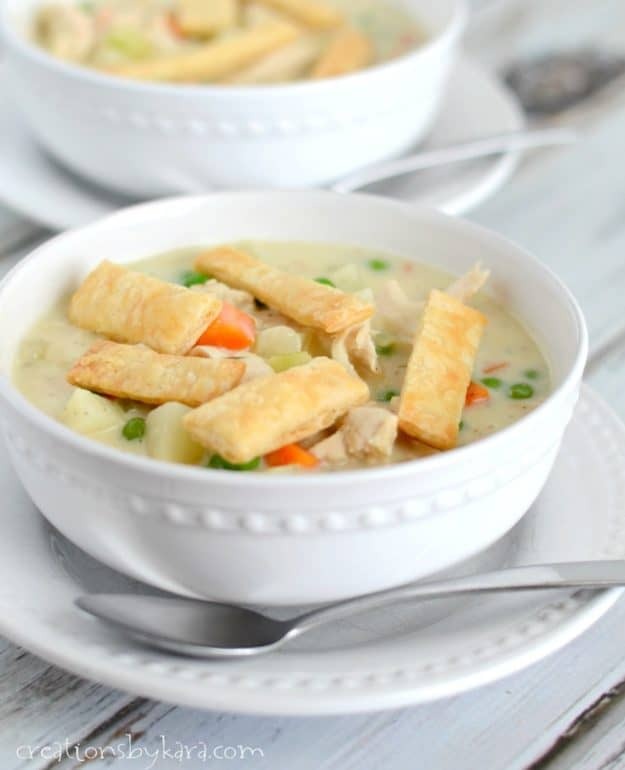 Chicken Pot Pie Soup. . . your favorite comfort food, now in soup form. A perfect weeknight dinner! A little over a year and a half ago, we took a family trip to Disneyland during the fall. One of the evenings was a little chilly, so we stopped at The Pacific Wharf Cafe for a bowl of soup in a bread bowl. I ordered the seasonal soup, which happened to be Chicken Pot Pie Soup. Oh my. It was so yummy that I actually came back the next day for lunch and ordered the very same thing. I never do that, so you know it was good! I vowed that when I got home, I would have to try and replicate the recipe. Then I got sidetracked. For 16 months. Ahem. But I finally did it! I came up with a recipe for chicken pot pie soup that was just as good as I remembered it. I got lucky this time, and it only took me one try. As soon as I tasted it, I knew it was a winner. Everyone in the family scraped their soup bowls clean. Hooray! I even topped it off with flaky strips of pie crust that I rolled out and cut with a pizza cutter. I made my own using this pie crust recipe, but you can definitely use store bought crust. I just didn’t have any on hand. It is the perfect addition to the soup, and add a nice crunch. Seriously, this soup is a new family favorite. I am already planning to make it again. It is absolutely scrumptious, and so hearty. Perfect for frigid winter evenings like we’ve been having here in Utah. 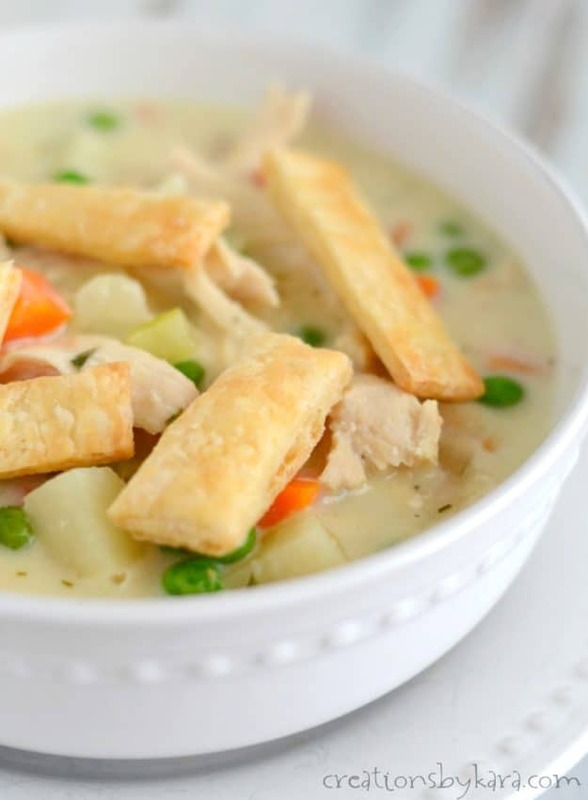 All the flavors of chicken pot pie in a tasty soup, garnished with pie crust strips. Melt 1 1/2 Tbsp butter in a large soup pot over medium heat. Add diced onions and cook for 4-5 minutes, or till onion is tender. Add celery, carrots, potatoes, water, chicken base, seasonings, and salt and pepper. Simmer till vegetables are tender, about 15 minutes. Meanwhile, roll out pie crust and cut into strips. Place on a large cookie sheet and bake at 425° for 10-12 minutes or till lightly browned and crispy. Set aside. In a medium sized saucepan, melt the 1/4 cup butter over medium heat. Whisk in the flour, then the milk and cream. Cook and stir till mixture bubbles and thickens. Let boil at least one minute, stirring constantly. Add to the vegetables and broth. Stir in the shredded chicken and frozen peas. Heat through and serve with pie crust strips. Today is actually National Soup Day, so I’m teaming up with the Celebrating Food Holidays Bloggers to share even more comforting soup recipes. 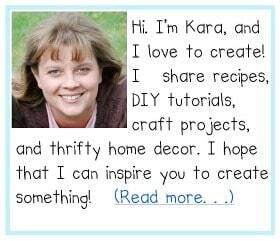 We have a few new faces this year, and I can’t wait to try all of the yummy recipes they’ll be sharing! I’ve been wanting to make this soup for so long! Looks delish and I’m sure my family would love it! 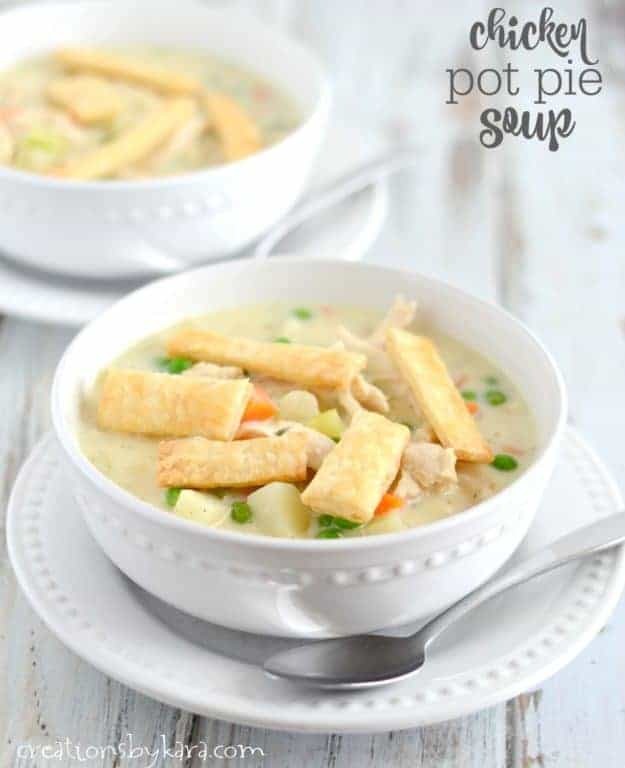 I feel like I need to top just about every soup now with those heavenly pie crust strips! Genius!! That is a great idea – they are so tasty! I feel like I need to top every soup from here on out with those crispy pie strips!!!! Genius! I love love love the pie crust “chips” on top! So fun!! They were definitely my kids’ favorite part! 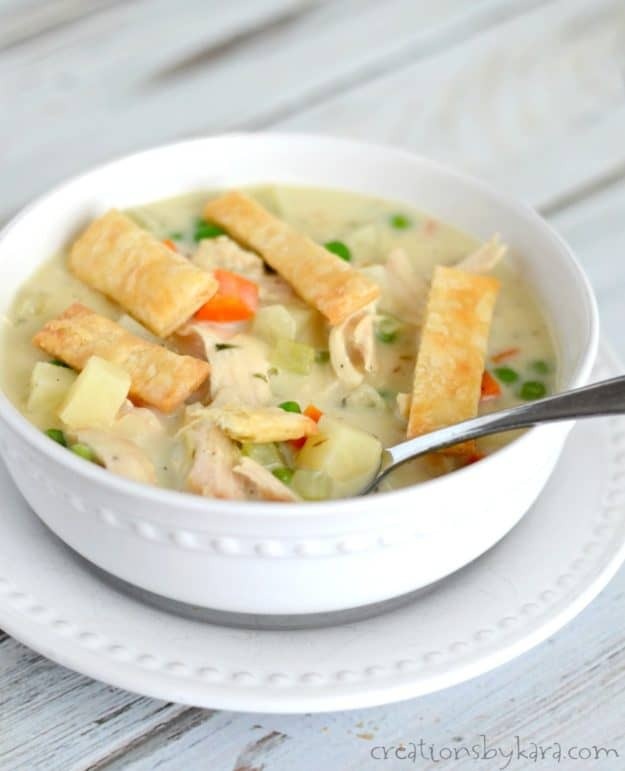 I adore pot pie, but hate how the crust get soggy for left over – the idea of cooking these pie strips so I can always top this soup with something crunchy is BRILLIANT! I’m with you Ashlee- soggy pie crust is the pits. I usually only put a top crust on my pot pies just to avoid that very problem! These add such a fun crunch to the soup. This has my name all over it. 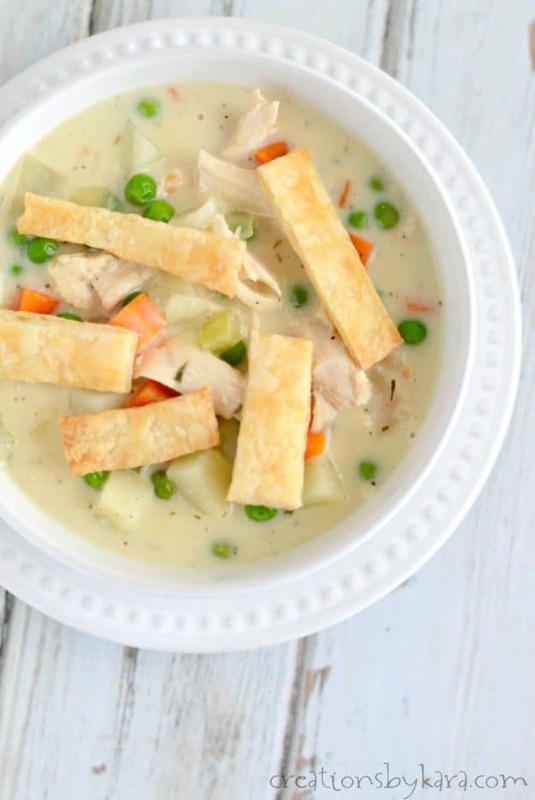 I’m a total chicken pot pie addict and the idea of it in soup form has me all giddy. I can’t believe I haven’t tried it sooner – so yummy! Going on my meal plan for next week! My whole family loves chicken pot pie. So I’m sure they’d gobble this up in a heartbeat! Haha, yes. I had to put them in a ziplock bag and hide them in my craft room so my boys didn’t eat all of them before we even sat down to dinner!